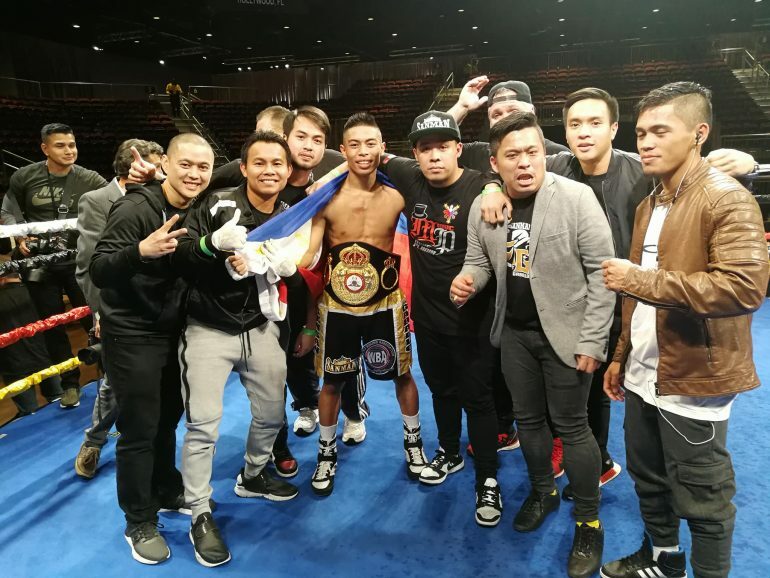 Reymart Gaballo was extended past the sixth round for the first time in his career but walked away with a wide unanimous decision victory over Stephon Young on early Saturday morning at the Seminole Hard Rock Hotel and Casino in Hollywood, Florida to win the interim WBA bantamweight title. The scores were 117-110 on two cards and 118-109 on the third, all for Gaballo (19-0, 16 knockouts), the 21-year-old from General Santos City, Philippines who hadn’t gone to the scorecards since his seventh pro fight. Gaballo looked set on ending things early in the third round, when a right hand bombed Young (17-1-3, 7 KOs) to the canvas shortly before the bell. Young, a tricky southpaw from St. Louis, Mo., spent much of the fight in survival mode, moving around the ring trying to negate the aggression of Gaballo in hopes of seeing his opponent fade late. Gaballo didn’t get his body attack going until late in the fight, but had enough stamina to hold off Young’s late-round attack. “I am very happy to be a world champion. I kept my word to beat him. I was quiet before the fight but during the fight I did more working than him,” said Gaballo, who had taken exception to Young’s pre-fight suggestion that Gaballo was being rushed into a big fight before he was ready. Young, a runner-up at the 2011 National Golden Gloves, represented a significant step-up in class for Gaballo, who had built his record up in the southern Philippines scoring easy knockouts before relocating to Miami to train under Osmiri “Moro” Fernandez. Gaballo had only about 30 amateur fights but went to finishing school in the gym with world champions like Shinsuke Yamanaka, Naoya Inoue and Guillermo Rigondeaux. “Reymart will be the next superstar,” said Jim Claude Manangquil of Sanman Promotions, who co-promotes Gaballo alongside The Heavyweight Factory. “They say he can’t go the full twelve rounds, they say he can’t box, they say he can’t beat a good fighter cause he only fought bums in the Philippines. On his Facebook account, Young said he had been arrested earlier in the day and had to pay $5,100 in back child support to be released in time for the fight. “Put up a good fight but today I wasn’t the better man,” Young said. Despite having a solid bout sheet, the show was not televised or formally streamed, and the main event didn’t begin until after 1 a.m. Eastern time. Gaballo’s Sanman Gym teammate Mike Plania didn’t fare as well in the co-main event, losing a unanimous decision to former bantamweight titleholder Juan Carlos Payano in a ten-rounder. Plania (14-1, 7 KOs), 21, of General Santos City, scored a knockdown in the third on a counter right but lacked the stamina to keep up with the awkward southpaw Payano (20-1, 9 KOs), 33, of La Vega, Dominican Republic. The scores were 97-92 on two cards and 96-93 on the third.